Mohamadi, N., Rajaei, P. (2013). Effect of Triamidefon fungicide on some growth parameters and antioxidant enzymes activity in tomato (Lycopersicom esculentum Mill.) plant under drought stress. International Journal of Advanced Biological and Biomedical Research, 1(4), 341-350. Neda Mohamadi; Peyman Rajaei. "Effect of Triamidefon fungicide on some growth parameters and antioxidant enzymes activity in tomato (Lycopersicom esculentum Mill.) plant under drought stress". 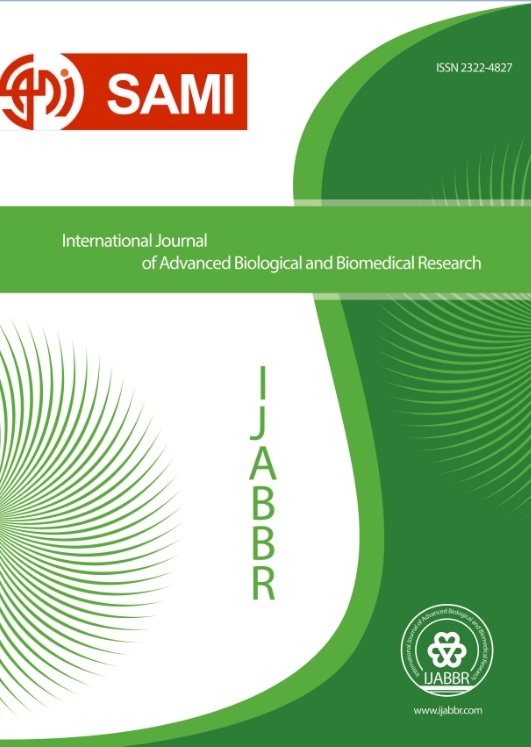 International Journal of Advanced Biological and Biomedical Research, 1, 4, 2013, 341-350. Mohamadi, N., Rajaei, P. (2013). 'Effect of Triamidefon fungicide on some growth parameters and antioxidant enzymes activity in tomato (Lycopersicom esculentum Mill.) plant under drought stress', International Journal of Advanced Biological and Biomedical Research, 1(4), pp. 341-350. Mohamadi, N., Rajaei, P. Effect of Triamidefon fungicide on some growth parameters and antioxidant enzymes activity in tomato (Lycopersicom esculentum Mill.) plant under drought stress. International Journal of Advanced Biological and Biomedical Research, 2013; 1(4): 341-350. Triamidefon is a triazole derivative, which have both fungicidal and plant growth regulator (PGR) properties, and also protect plants from several types of abiotic stresses. The influential mechanism of Triamidefon on plants is not much studied. In this study effect of this compound on the drought stressed in tomato plants was investigated. The plants were subjected to 5 day interval drought stress and drought stress with TDM (15mgl-1) and TDM alone from 30 days after sowing. The plant samples were collected for estimating the related analysis. Individual and combined drought stress and TDM treatment increased dry weight, Chlorophyll content, SOD, CAT, PPO activities and decreased leaf area and prolin content. From the result of this investigation it can be concluded that the application of TDM caused a partial recovery of the damaging effect of drought stress by its influence on antioxidant system. Bates, L.S., Waldern, R.W. and Treare, L.D.)1973(. Rapid determinatation of free proline for stress studentes.Plant and Soil, 39: 205-207. Berova, M., and Z. Zlatev. )2003(. Physiological response of paclobutrazol-treatedtriticale plants to water stress. Biol. Plant, 46:133-136. Buchenauer, H., Rohner C.(1981) Effects of triadimefon and triadimenol on various plant species as well as gibberellin content and sterol metabolism in shoots of barley seedlings. Pest Biochem. Physiol, 15:58–70. Cakmak, I., Horst W.J. )1991(. Effect of aluminium on lipid peroxidation, superoxide dismutase, catalase, and peroxidase activities inroot tips of soybean (Glycine max). Physiol. Plant, 83: 463-468. Chandrashekar, K.R., Sandhyarani, S.)1996(. Salinity induced chemical changes in Crotalaria striata Dc. Plants. Indian J. Plant Physiol, 1: 44–48. Fletcher, A., Gilley, A., Sankhal, N., Davis, T.M. )2000(. Triazoles as plant growth regulators and stress protectant. Hort.Rev, 24:56-138. Foyer, CH, Noctor, G. )2000(. Oxygen processing in photosynthesis: regulation and signaling. New Phytol, 146:359–88. Ghanati F, Morita A, Yokota H. )2005(. Deposition of suberin in roots of soybean induced by excess boron. Plant Science, 168, 397-405. Giannopolitis, C.N. and S.K. Ries. )1977(. Superoxide dismutase I. Occurrence in higher plants. Plant Physiol., 59: 309-314. Gomathinayagam, M., Jaleel, C.A., Lakshmanan, A., Paneerselvam, R.(2007). Changes in carbohydrate metabolism by triazole growth regulators in cassava ( Monihot esculenta Crantz) effects on tuber priduction and quality. C. R. Biologies 330: 644-655. Graebe, J.E .)1984(. Die Gibberellinbiosynthese in zellfreien Systemen aus unreifen Kurbis- und Erbsensamen. Ber Dtsch Bot Ges, 97: 67-74. Grossmann, K., Kwiatkowski, J., Siebecker, H., Jung, J. )1987(. Regulation of Plant Morphology by Growth Retardants. Plant Physiol, 84: 1018-1021. Jaleel, C.A., Gopi, R., Alagu G.M.. Lakshmanan, R. Panneer-elvam. )2008(. Triadimefon induced changes in the antioxidan metabolism and ajmalicine production in Catharanthus roseus (L.) G. Don., Plant Sci, 171: 271–276. Jaleel, C.A., R. Gopi, G.M. Alagu Lakshmanan and Panneerselvam, R.(2006). Triadimefon induced changes in theantioxidant metabolism and ajmalicine production in Catharanthus roseus (L.) G. Don. Plant Sci., 171: 271-276. Kramer, P.J. (1983). Plant Water Relations, Academic Press, New York. Lichtenthaler, H.K. )1987(.Chlorophyll and carotenoids: pigments of photosynthetic biomembranes. Method in Enzymology. 148: 350-382. Manivannan, P., Jaleel, C.A., Sankar, B., Kishorekumar, A.,Somasundaram R. )2007(. Growth, biochemical modifications and proline metabolism in Helianthus annuus L. as induced by drought stress. Colloids and Surfaces B: Biointerfaces 59: 141–149. Marshall, J. G., R.G. Rutledge, E. Blumwald, and E.D. Dumbroff. )2000(.Reduction in turgid water in jack pine, white spruce and black spruce in response todrought and paclobutrazol. Tree Physiol, 20: 701-707. Sestak, Z., Catsky, J., Jarris, P.G. (1971). Plant Photosynthetic Production: Manual of methods, Dr. W. Junk N.V. Publ., The Haque. Smirnoff, N.(1995). Antioxidant systems and plant response to the environment, in: V. Smirnoff (Ed. ), Environment and Plant Metabolism: Flexibility and Acclimation, BIOS Scientific Publishers, Oxford, UK. Still, J.R. and W.G. Pill. (2004). Growth and stress tolerance of tomato seedlings(Lycopersicon esculentum Mill.) in response to seed treatment with paclobutrazol. J.Hortic. Sci. Biotec, 79: 197-203. Thomson, J.E., R.L. Legge, and R.F. Barber. (1987). The role of free radicals insenescence and wounding. New Phytol. 105: 317-344. Vamerali, T., M. Saccomani, S. Bons, G. Mosca, M. Guarise, and M. Ganis.(2003). A comparison of root characteristics in relation to nutrient and water stress in twomaize hybrids. Plant Soil, 255: 157-167. Zhu, L., A. van Peppel, X. Li, and M. Welander. (2004). Changes of leaf water potential and endogenous cytokinins in young apple trees treated with or without paclobutrazol under drought conditions. Sci.Hortic, 99: 133-141. Berova, M., and Z. Zlatev. )2003(. Physiological response of paclobutrazol-treated triticale plants to water stress. Biol. Plant, 46:133-136. Marshall, J. G., R.G. Rutledge, E. Blumwald, and E.D. Dumbroff. )2000(. Reduction in turgid water in jack pine, white spruce and black spruce in response to drought and paclobutrazol. Tree Physiol, 20: 701-707. Still, J.R. and W.G. Pill. (2004). Growth and stress tolerance of tomato seedlings (Lycopersicon esculentum Mill.) in response to seed treatment with paclobutrazol. J.Hortic. Sci. Biotec, 79: 197-203. Thomson, J.E., R.L. Legge, and R.F. Barber. (1987). The role of free radicals in senescence and wounding. New Phytol. 105: 317-344. Vamerali, T., M. Saccomani, S. Bons, G. Mosca, M. Guarise, and M. Ganis. (2003). A comparison of root characteristics in relation to nutrient and water stress in two maize hybrids. Plant Soil, 255: 157- 167.